The Internet provides a safe and convenient forum for people to shop and communicate with friends and family. And while Ballina Chamber of Commerce promotes and supports shopping locally with local retailers, people are now shopping on the internet. Market research suggests that more and more people are conducting their shopping online with 30% of consumers expecting to use their mobile phone as their main shopping tool in the future1. December 2016 saw an increase of 15.4% in online purchases2 with over 50% of Irish people shopping online3, most of whom purchased or sold goods and services with no difficulty. However, in a small number of cases difficulties do arise and fraud results in users losing money or having their credit/debit card details being compromised. Cyber Monday and Christmas is a time when consumers switch to online forums to get the last minute or cheap purchase. Goods that aren’t available in stores can be found online, sometimes at cheaper prices; all of which increases the attraction of online shopping. 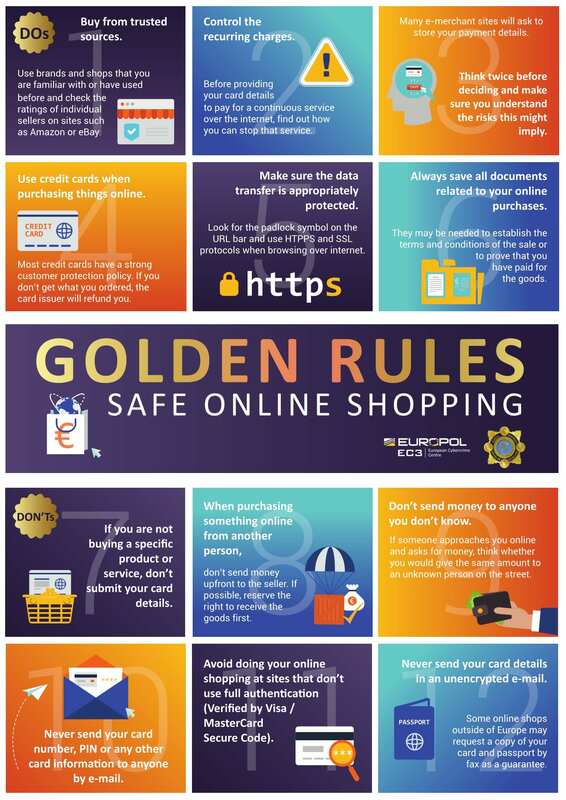 Anyone shopping on the Internet should take greater precautions when purchasing goods online then they would when they purchase in shops. An online marketplace doesn’t have the security of being face to face contact with seller in a known physical location. Always save all documents related to your online purchases. Retailers can also be the target of online frauds when it comes to purchases or goods online. Compromised credit cards of requests to pay for goods and services using money transfer services can result in significant losses for online sellers. To avoid those losses, some basic steps should be kept in mind by online retailers and private sellers. If you capture IP addresses check them online to see where they are registered. If the billing/delivery address is in a different country, this could indicate a problem.